If , like me, you love watching grossly overpowered cars designed only to get from Point A to Point B in a straight line scream down a track at full throttle...then this is one of the cars we have to thank for it. 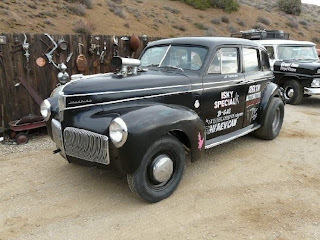 The seller claims that this car won the race at Pomona Raceway on July 6, 1958 that ignited the 'Gasser Wars' between the makers of Isky and Howard cams. One of Jr. Thompson's first 'Gasser' cars, it went on to win the first “Little Eliminator” class championship at the '58 U.S. Nationals in Oklahoma City. Since the top two classes that year were 'Top Eliminator' and 'Little Eliminator', and the top two classes nowadays are 'Top Fuel' and 'Funny Car', I guess one could argue that today's high-tech, 7,000hp, 300+mph nitro powered funny cars are direct descendants of this very car. Hmmmmm. The car looks very original down to the improvised seat covers and period decals. 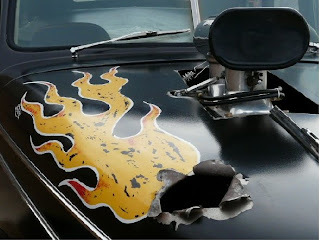 There's even an original hole in the hood caused by an interesting incident between Junior Thompson and his older brother, Eddie. You can read about that incident, as well as lots of other interesting tidbits, on the seller's web site here. Who You Callin' a Midget? 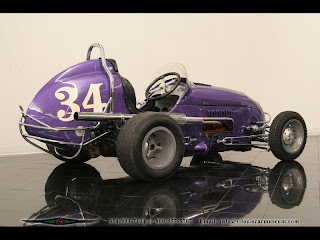 Okay, so here's a very cool '48 Kurtis Kraft Midget car which appears to be a nice older restoration and very original. 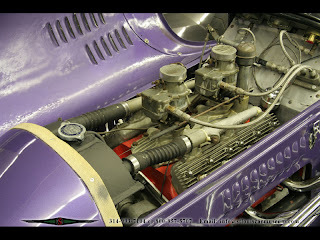 Ford flathead V-8 with dual Stromberg carbs and Eddie Meyer intake. 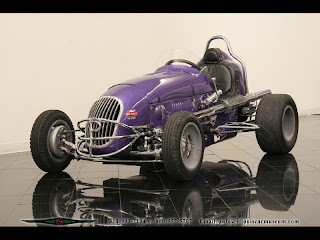 The old midgets are just awsome to look at...works of art, really. And I love the purple paint and tons of chrome. I mean, can you imagine that much chrome on a modern race car? It just isn't done. 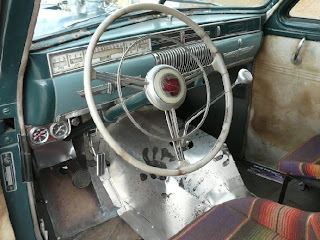 And the period magnesium knock-offs add the perfect touch to a very nice example. If you have a copy of "Kurtis-Kraft Midget – A Genealogy of Speed", by Bill Montgomery, there is apparently a bio of this car on page 99. I don't have a copy, so I don't know what it says. Offered for sale by the St. Louis Auto Museum on eBay here. 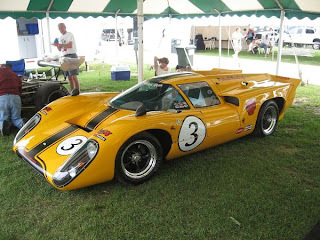 Here's a sweet '69 Lola T70 body in vintage orange on a McKee space frame. 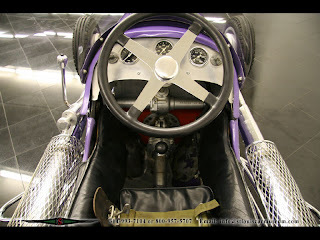 The car was originally an open-cockpit, aluminum-bodied car commissioned by Caroll Shelby. The owner claims it was the third frame made by Bob McKee, which I guess would be one of the first five one-off custom frames McKee made before rolling out the MkVI design in '66. 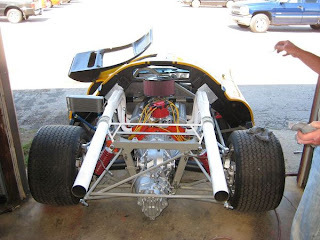 At some point, the body was replaced with the closed-cockpit Lola seen here. Slick. Power is from a 357 Chevy small block producing 485bhp. For a car weighing 1650 lbs, you figure the things gotta move pretty well! Currently set up for SVRA Group 5 or 7 racing, the owner is taking offers. I could cash out my IRA but I don't think it'll be enough! You can view the listing here on race-cars.com. Retro Racers highlights vintage and historic race cars for sale that I found interesting in some way. You'll find cars from all kinds of racing--from the old 'Gasser Wars to Indy car and everything in between. Really, the only common denominator is that they are all old, which I will arbitrarily define as pre-1980, and were listed for sale at the time of posting somewhere on the web. I'll include a summary of the listing and a link so that you can check it out yourself should you so desire. If you run across something interesting yourself, please submit it by emailing me at kblupino2@bellsouth.net. I do reserve the right to edit which listings get posted but am always open to your input! Thanks for visiting, and I hope you enjoy these old cars as much as I do! historic race cars. vintage race cars. vintage racing cars. historic racing cars. for sale. old racing cars for sale. gasser wars. 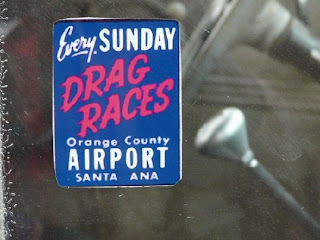 vintage drag racing. stock cars. vintage indy cars. vintage sprint cars. 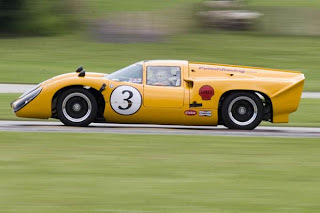 vintage formula 1. vintage can-am. 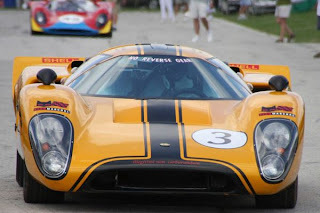 historic formula 1. historic can-am. vintage scca. historic scca.